Austin County Emergency Communications District (ACECD) funds and maintains the infrastructure of 911 Dispatch and emergency responders in Austin County. ACECD is not the same entity as Austin County government which oversees 911 Dispatch. ACECD does not provide any emergency dispatching or services. Our mission is to provide equipment and GIS mapping for fast and reliable communications between the public and their public safety agencies. These agencies include Bellville Police Dept., Bellville Volunteer Fire Department, Sealy Police Dept., Sealy Fire Department, Austin County EMS, Austin County Sheriff's Dept., Texas DPS, First Responders, and eight other volunteer fire departments. Please take some time to review the information found on our site. Be informed - make the right call. Our purpose comes from the Emergency Telephone Number Act of 1989. Subchapter D. Emergency Communication Districts: Counties with population over 20,000. 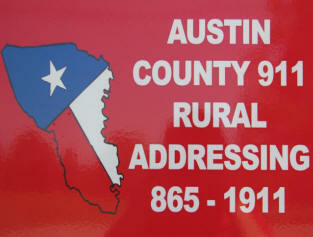 Please click here to read the full subchapter D.
ACECD issues addresses in the unincorporated areas of Austin County and provides reflective address plates for new addresses. An address request form is provided via the link above (FORMS). To report damaged/missing road signs please contact your county commissioner. A service provided by Austin County to notify residents of important notifications including emergency situations/warnings. For more information and to register click on the link below. 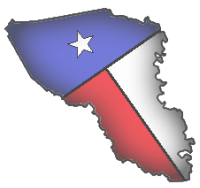 We are located northwest of Austin County Courthouse in Bellville. From Courthouse head northwest on Main St. (HWY 36 N) toward Brenham. Immediately after the Shell station on the right you will see small duplexes. Turn right at the duplexes and continue past EMT Station 1. Our Building is located next to the EMT Station.